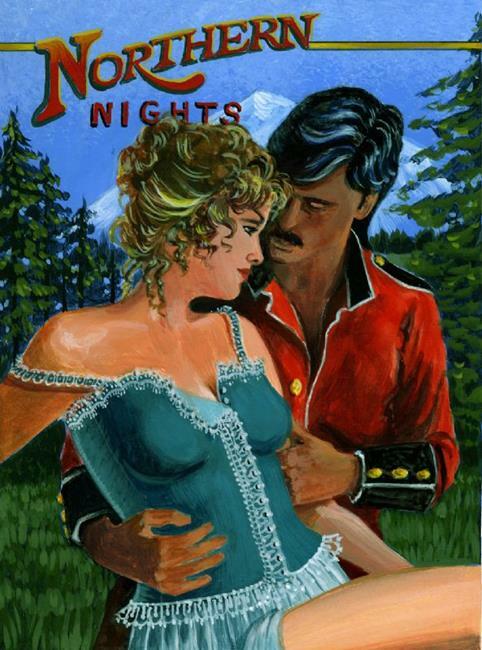 "Northern Nights" A sweeping novel of forbidden love in the Yukon Territories of Canada.... Mistakenly accused of a heinous crime, the lushly beautiful Gabrielle St Claire flees her family home to hide out in the frozen wastelands of the Yukon. Betrayed by her best friend, she is determined to clear her name and have her revenge. With the headstrong will bred into her by her aristocratic French mother, her ravishing beauty and quick wit, she manages to elude the men hot on her trail. There is one man who follows her doggedly, whose thirst for justice and passionate nature matches her own. It is the handsome Sergeant Lance Roark of the Royal Canadian Mounted Police. He will stop at nothing to capture his prize. Against the stirring grandeur of the frozen north, "Northern Nights" unfolds the saga of two well matched and unforgettable lovers caught up in a passionate battle of wits, love and lust. ----------------------------------------------------- ----------------------------------------------------- This illustration was done with acrylic paints on bristol board....I usually use oils when painting but to meet the deadline I decided to use paint that dried quickly...harder to use to create smooth skin, but it got the job done.